You must make reservations at least 5 minutes in advance of the time at The Bull Ring. Underground parking is available at 150 Washington Ave. Please receive parking ticket and the Bull Ring will validate parking ticket after 4p.m. nightly. Public Transportation is provided by the Rail Runner. Classical Guitarist plays on Friday & Saturday Nights from 6:30p - 9:00pm. The Bull Ring has been a part of Santa Fe’s Culinary landscape for so long it's hard to think of a time when it wasn't there. 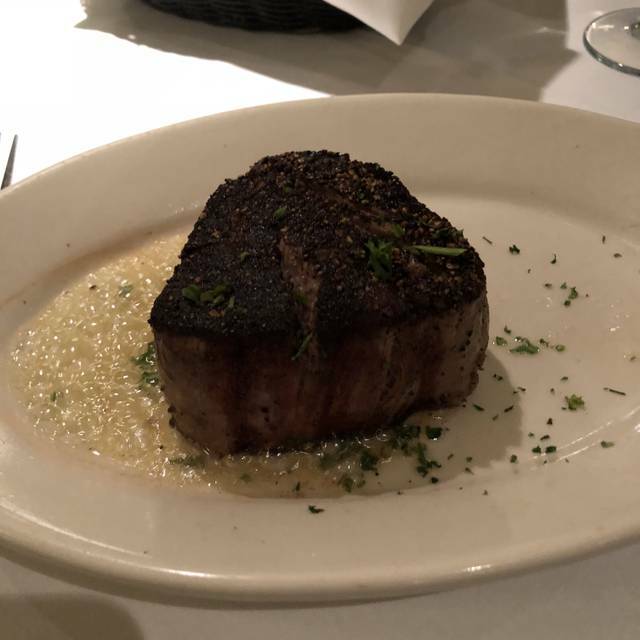 The world famous Bull Ring offers all the most popular cuts, ranging in size from the the 8-oz petite filet to an enormous 40-oz porterhouse for two. The Bull Ring prepares steaks in an 1,800 degree grill and serves them on a sizzling hot plate with melted butter. The Bull Ring is also known for their juicy lamb or pork chops, mouthwatering barbecue baby back pork ribs or fresh seafood. If you are looking for a more casual experience, the lounge is a local favorite, where you can mingle with old friends or make new ones in a Cheers-like atmosphere. The bar serves exceptional pub fare, including the succulent Prime Burger. Crisp greens of romaine, tossed with our own caesar dressing. With grilled chicken. White chicken strips, with greens and crisp oriental vegetables tossed in our own oriental style dressing. Lettuce, feta cheese, black olives, tomatoes, cucumbers, red onion, chick peas, greek peppers, served with herb dressing. Crisp greens with diced breast of chicken, peas, scallions, muenster cheese and bacon. Your choice of dressing. A delicate combination of diced chicken, black olives, chopped eggs, bacon bits and blue cheese on a bed of lettuce. Choice of dressing. Crisp mixed greens, artichoke hearts, scallions, red bell peppers, pea pods, almonds, and fresh salmon lightly blackened, served with ranch dill dressing. 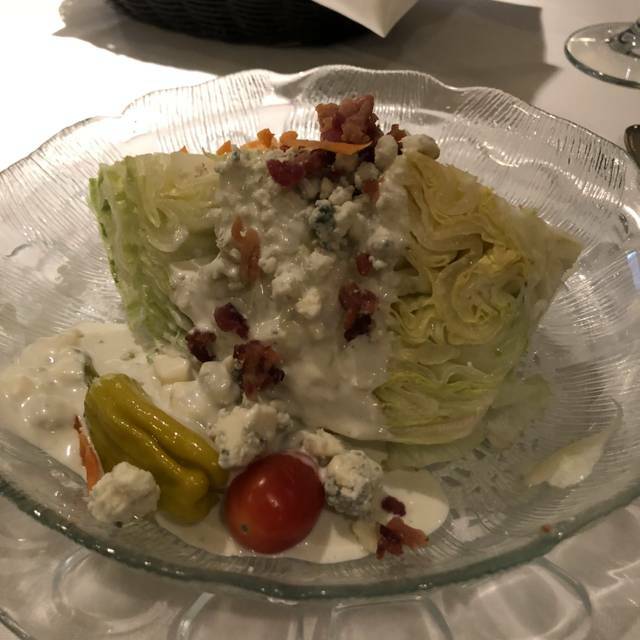 Crisp mixed green salad, topped with shrimp, artichoke hearts, bacon bits, crumbled blue cheese, tossed in our special dressing. Julienne of beef tenderloin sauteed and presented on a bed of fresh greens with a delicate vinaigrette dressing. U.s. Prime new york strip broiled to your liking. Served open-faced on sourdough bread. Fresh tuna smothered in grilled onions, on toasted sesame seed bun with lettuce, tomatoes, remoulade. Tender breast of chicken, lettuce, tomato, remoulade and cheese on a sesame seed bun, can also be blackened. Half-pound of fresh chopped steak broiled to your liking. Half-pound of fresh buffalo broiled to your liking. Served open-faced on sourdough bread with creamy horseradish, grilled onions and french fries. Tender slices of roasted prime rib served on a french hoagie roll with au jus and french fries. Tender slices of u.s. Prime beef, sauteed peppers and onions and our own special cheese sauce, served on a french hoagie bun. Served with fresh vegetables and your choice of rice or hand cut fries. The most tender corn-fed mid western beef, served sizzling hot. Side: rice, hand cut fries. The meatiest, tenderest cut of pork chop. Broiled to perfection, served sizzling hot. Side: rice, hand cut fries. We offer fresh fish, never frozen and grilled to perfection. Can also be blackened. Side: rice, hand cut fries. Served with mashed potatoes, white gravy, and fresh vegetable. Bacon, lettuce, tomato and mayo on toasted sourdough, and hand cut fries. Battered haddock, served with hand cut fries and tarter sauce. Ham, turkey, bacon, cheddar cheese, tomato, green chile, lettuce and mayo wrapped in a tortilla. Served with mashed potatoes, white gravy, and fresh vegetables. Battered shrimp, served with hand cut fries and chipotle mayo. 3 crab cakes served with our special crust, on a bed of lettuce, garnished with caribbean sauce and spiced tropical fruit. One of the top 3 bone-in ribeye I've ever had. Delicious, old school steakhouse. Be prepared - quite pricey. My wife and I were in town for our 20th anniversary and were looking for a steak. We were referred by a friend to the Bull Ring. The food and the entire experience were exceptional. The prime rib was moist and had excellent flavor. The service was just as good. When we come to town again we will be eating at the Bull Ring. Great food and wonderful service. Thanks. Our waiter was extremely professional. The food was excellent and our service was great. We have a new favorite. We were very disappointed in our recent visit to the Bull Ring. I had the prime rib and my husband the rib eye. Both were extremely tough. We will probably not ever go back. My husband loves a blue steak.. the chef made him one that he says was the bet he has ever had! We loved our Escargot appetizer. My bone in fillet was cooked to perfection. Did not care for the au gratin potatoes. Swimming in cheddar cheese, bland flavor. The baked potato was outstanding and large enough to share. The best steak , cooked to perfection that I've had in many a year. We come here every spring break when we visit Santa Fe. 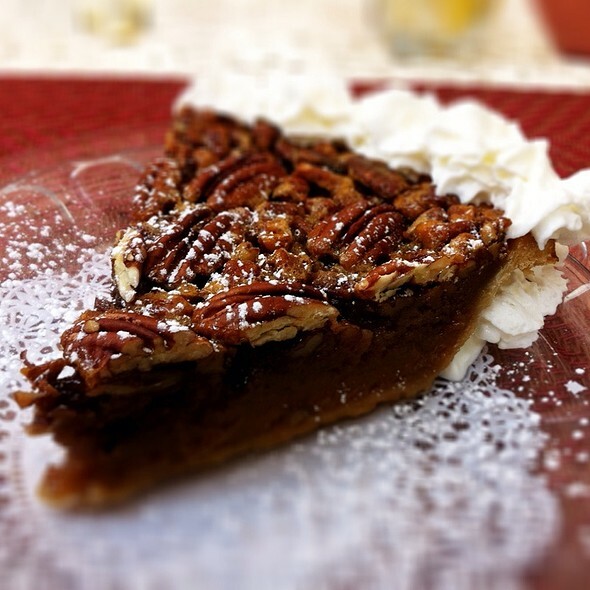 The food and service are consistently great. The food was very good but the portions were very small. I had the Chicken Fried Chicken and while it was quite good my portion was about the size of a small hamburger. I actually ordered an additional piece which they happily provided at an additional price. I am not a big eater but I was very underwhelmed. My female companion had the Chicken Fried Steak and it too was modest but good. Drinks were good and overall I would recommend this restaurant and will return. The service was great from the time we walked in the door, until our meal was finished. The waiter was very personable and our meals came out of the kitchen in a timely manner. The ambiance was very comfortable and pleasant. I would certainly recommend this venue to all. Been to Bull Ring dozens of times - used to be one of our favorites. Positives first - corned beef and cabbage was outstanding and everyone was friendly and polite. Unfortunately, service was not the appropriate level/intensity for a $40-60/person tab. Had to ask for water and bread refills. Came out with completely wrong steak order the first time (a rib eye vs gentleman's cut filet). Second time also incorrect order, but didn't complain so we could eat together ( instead of medium gentleman's cut filet, bone-in and practically raw). The server did offer to take it back to cook longer, but corned beef entree was already finished. The caesar also came out with a couple of past-gone leaves and the baked potato was dried and seemed old. Anyway, we love the steakhouse atmosphere and friendliness of staff, but we'll be giving other steakhouses a try. Last day of family vacation. It was memorable. Delicious steaks and sides. The food and the service were on par with Morton's of Chicago or Truluck's. We will definitely be returning. Time between ordering and delivery of food felt extremely long. Way too long. The food was great. Our problem was with the waiter. He did not seem to like our table. Was never around. Told him we were ready to order he left and came back 10 min later to take our order. Great steak!!!! Great service!!! 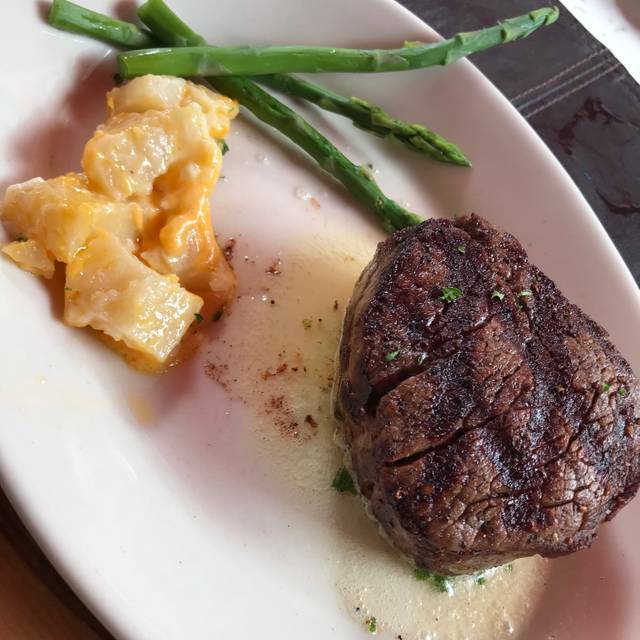 I would recommend to anyone looking for a great steak in Santa Fe! My wife and I visited the Bull Ring for her Birthday and we were both impressed. Miguel, our waiter made our dining with you even more enjoyable we lacked for nothing. We will definitely dine with you again and we have already recommended you guys to friends. My favorite place to eat. I usually come to dine at the Bullring whenever I want a great dinner and fun time. Amazing as always! Thank you for everything. See you in the summer. We’re from Texas, so we have an abundance of fine dining steakhouses to chose from, but we were in Santa Fe for a ski trip and wanted a change from casual dining or fast food. What a treat! My grandson ordered baby back ribs and practically licked the plate. My husband ordered the filet and said it was as good as any he’s ever eaten. The special was Chilean Sea Bass (my favorite) and I was in heaven. The au gratin potatoes and Mac n cheese were great sides. The server made a scoop of ice cream my grandson wanted look “fancy”. He was thrilled with it. We’ll be back next trip to Santa Fe! Food was very good but over priced. Requested my food be boxed to take home and all of my food was not packed. Just the steak. Thjs very upsetting since the cost over priced. Our server was great and attended to our needs. Especially when one us ordered lobster and you were out and did not account for the holiday rush. Need to better plan. Very disappointing. Great food, ambiance and outstanding service. The staff was personable, efficient, friendly and attentive without being too invasive. Great experience! The food was awesome. Literally the best steak I have eaten. Fast service. Didn’t want long at all for our food. As usual....great! 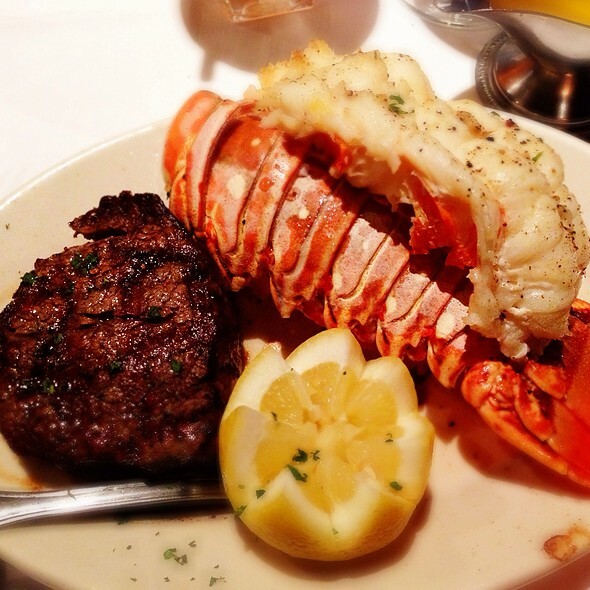 Perfect for a Valentine dinner Steak and Lobster for two. Saw several friends there that felt the same. First time visiting the Bull Ring. Service was great. Not thrilled with the meal for the price. Holland size sauce was gloopy and not smooth and creamy for my vegetables. Excellent food, drinks and service. A big party next to us was a bit loud. We walked with reservations. We were seated right away. Andrew was our waiter and he was great. Food was brought in a very timely fashion and it was delicious. The wait staff cleared used dishes with perfect timing. When we were done we called Lisa over to commend her on her staff. We are from Albuquerque and the 60 minute drive is very well worth it. The Bull Ring was wonderful! Immediate seating, knowledgeable and kind staff, delicious steaks literally sizzling on the plate when served and pleasant atmosphere. Had dinner here 2 days ago. The salads were OK, not exceptional. The veal chop & the lamb chops were outstanding however & cooked to our specifications, perfection. Nice wine list, though pricey. We had a great dinner with some friends & colleagues while we were in town for Las Cruces Day in Santa Fe! We all ordered steak and everyone was pleased...I will say they are huge! The au gratin potatoes are a must too! Food was excellent as was the service. It was a little noisy and tables are close. Will definitely go back again soon. Definitely one of the best steaks I’ve ever had. Would recommend, on the higher end but well worth the price. Actually went back in the same week with a business trip and had the salmon and was also very good. The food was amazing! Best prime rib ever!! I would definitely go back again. The Bull Ring is our ONLY choice for steakhouses while in Santa Fe. The food and service is always excellent. No need for us to go anywhere else.